I didn't nominate it, but I thought this was a theme rich in promise. Unfortunately, it seems I'm blogging alone this week. Ah well. The full quote (attributed to our friend Plato) runs thus: "An empty vessel makes the loudest sound, so they that have the least wit are the greatest babblers." He was a very clever chap, old Plato, if a trifle supercilious. His aphorism is more commonly rendered in pithier form as "He who knows least speaks loudest" and while it's not a universal truth, I'm sure we all know friends, colleagues, presidents to whom it could be applied with some justification. However, I'm going to steer clear of addressing issues raised by the second phrase in Plato's maxim - tempting though it would be go on the offensive against the vile bigotry that lay behind this week's atrocity in New Zealand - because I already had an idea in mind suggested by the first part - and it's this: if ever an empty vessel could have been said to resonate loudly in the popular imagination (down through nearly 150 years now), that vessel was the Mary Celeste, found deserted and drifting 500 miles east of the Azores in early December 1872 with no apparent clue as to why the crew had left their ship. None of them was ever heard of again. The story of the Mary Celeste first gripped me as a schoolboy, as indeed it had gripped Victorian England and America, from where the vessel and its crew had originated. The mystery of a ship in perfect working order deserted seemingly on the spur of the moment for no discernible reason was the stuff that imagination could run away with - and run away it did, spinning a legend as it went. Arthur Conan Doyle, never one to let cold fact get in the way of a hot yarn, wrote a short story about the mystery for Cornhill Magazine in 1884. He portrayed a tidy ship adrift, not a coil of rope or sail out of place, table set for breakfast and the crew entirely missing with no sign of violence or sudden departure - a riddle to be solved. Various newspapers and periodicals speculated on what had happened, disregarding or embellishing the known facts as they saw fit. The enduring legend of the Mary Celeste and its vanished crew was born. Of course there was a spate of theories, some more plausible than others. Had the ship been boarded by pirates or subject to a mutiny by the crew? There were no signs of violence and nothing had been plundered. Could the crew have all eaten contaminated food (bad flour being the principal culprit), hallucinated and jumped overboard? Again no evidence was found. Had they feared the ship's cargo (1,700 barrels of poisonous 'denatured' alcohol) was about to explode and so abandoned ship? Once more there was no hard evidence to suggest this was the case. Had they been washed overboard by a sudden waterspout? Or abducted by an alien space-ship (a novel idea in the 1880s)? Or plucked from the safety of their craft by a mighty malevolent sea creature? 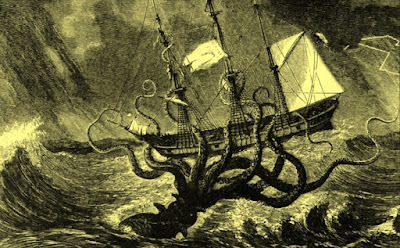 This latter giant squid theory, though of course completely implausible, is my favourite bonkers solution to the enduring mystery of the disappearing crew. Here are the hard facts. 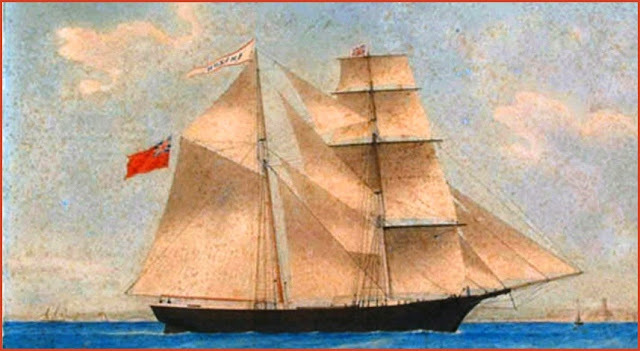 The Mary Celeste was found by another merchant ship plying the same route from New York to Europe some nine days after the last entry was made in the ship's log. The log itself gave no hint of any problems with the vessel, its cargo or its crew, The ship's company actually consisted of Captain Briggs, his wife and baby daughter and seven "peaceable and first class" sailors. For a reason still to be determined - and perhaps it never will be - the whole contingent appears to have abandoned ship in orderly fashion one morning just off the island of Santa Maria, for the boat's dinghy (which doubled as life-boat) was missing from the deck along with the captain's navigation equipment. In all other respects, the Mary Celeste appeared to be in good trim and was well-provisioned. It was subsequently sailed to Gibraltar where it was the subject of a rigorous examination and a formal salvage hearing. This latter proved inconclusive and the Mary Celeste was released back to its owner to belatedly complete its journey under fresh crew to Genoa in Italy. Many hundreds of articles, several books and documentary and motion picture films have explored the intriguing phenomenon of this most famous of empty vessels. The riddle of the Mary Celeste endures as the stuff of legend. in which he had been snared. a duty owed in perpetuity. nigh on three long centuries. may return to claim his silver hoard. who dares to try and steal Bartolomeu's reals. So well written Steve - fabulously fishy frolics. Do you remember Quink? I always thought that was squid ink. I thought this was very good. I've never read the Arthur Conan Doyle story - is it worth tracking down? I did see one of those documentaries you mention and their favourite theory was that fumes from the alcohol began to leak and forced the crew to abandon ship. There can't be many squid poems out there so yours must surely be up with the best of them. Ha ha ha Steve, that's so funny. I just googled Diabdomar and the only entry that came up was this blog! Did you invent it? Hello Clive. Pure invention I'm afraid, for the most part - certainly Diabdomar, I just made that up; (diabo-do-mar would approximate to devil of the sea in Portuguese. )However, all the geographic stuff is true (Santa Maria and Sao Lourenco), Bartolomeu was an actual pirate and the Mary Celeste was found deserted as stated. Excellent Steve, that's the best theory yet! You could certainly give Conan Doyle a run for his money. I absolutely love this. Well done Steve. It had to be swashbuckling :-) I really enjoyed this blog and top poem. Thx. Very clever, the whole thing. An excellent effort. Bravo Steve - another great read. I love your squiddly diddly poem. Steve I love this blog. It's so inventive.